A Springbrook-to-Red Deer walking trail has taken a big step forward. Red Deer County council approved a route and gave staff the green light to apply to the TransCanada Trail Foundation for up to $1.5 million in funding. The 11-km route runs north from Springbrook up Range Road 280 to Township Road 381, where it links to 32nd Street. Paul Pettypiece, president of the Central Alberta Regional Trails Society, said the county's support gives the local trail movement a big boost. Central Alberta trail advocates have been working with Alberta TrailNet and the TransCanada Trail Foundation and funding has been all but promised. The national trail organization has money available as part of its drive to create a country-spanning route in time for Canada's 150th birthday in 2017. "I wouldn't say it's a 100 per cent sure thing, but it's a 95 per cent sure thing," said Pettypiece of the $1.5 million grant. The funding application must be in by the end of the year. Corporate, community and private donors will also be approached to help fund the trail, which will cost $2.4 million to $3.3 million. "The financial burden on the county will be relatively small," he said. County chief administrative officer Curtis Herzberg said council's route approval does not commit the county to any funding. More detailed financial information on building, operating and maintenance costs would follow if the grant is approved. Mayor Jim Wood said he liked the idea of the local trail forming part of the national network and pointed to the popularity of the City of Red Deer's trails. "I believe this is going to be a great addition to the county," said Wood. Coun. Christine Moore was another big supporter of the trail proposal. "I'm really happy this day has arrived," said Moore. "There is a lot of work to do. This is just the beginning. "You know the old movie Field of Dreams, 'build it and they will come?' That's what's going to happen here." The only dissenting vote came from Coun. Richard Lorenz. He is not convinced that the trail will be well used and was concerned with saddling the county with future maintenance costs. There are other more pressing priorities in the county than establishing trails, he said, before voting against the route and grant application motion. A new coat of paint may be in the works for an important connector in the Waskasoo Park trail network. The CPR Bridge is slated for a $3.7 million repair and paint job as part of the administration-recommended 2016 capital budget. A 2013-report identified structural deficiencies that could contribute to future problems and public safety issues. Another assessment in 2014 indicated the presence of lead paint. The capital funding request will address the immediate required repairs and safely remove the lead paint and re-coat the entire steel truss bridge. The majority of the cost is related to the remediation of the hazardous paint. CPR donated the old train bridge to the city in 1990 and two years later the city converted it into a pedestrian bridge. In 1993, the bridge was designated a Provincial Historic site. The bridge was originally constructed in 1891 as a wooden trestle. Early this summer, I wrote a column about Red Deer's project to count the users of our trails network in certain areas. I suggested that people would be surprised by the numbers, perhaps even me. Well, I have to admit I am surprised. While the city parks department seems pleased that there are more than 200,000 crossings a year at the CPR pedestrian/bike bridge (based on usage on the three-month study), I actually thought the numbers be double or triple that -- or more. I had no doubt that the Three Mile Bend off-leash dog park would rank highly on user counts, as would Bower Ponds -- which always seems to be busy. And it should surprise no one that trail usage at McKenzie Trails -- as pretty a park as any in this town -- would count fairly low (more on that later). It's just that, as good as the numbers appear for trails usage in the city, I expected more. I really thought that there would be points on our trails network that would peak above 1,000 crossings on some days. The CPR Bridge, for instance, is a major transportation route for non-motorized traffic accessing our city centre, and it was declared "busy" with an average of 560 crossings a day. City parks superintendent Trevor Poth reported one interesting item the study uncovered: trails usage is an everyday occurrence, not just a weekend or good-weather thing. There are peaks and surges in places, of course, but the study found that overall, we use our trails pretty well the same every day. This is probably the most important finding of the trails count study so far. Red Deer rightly regards our trails network that links our city parks as a recreational and active-living gem. It is that, and more. Our trails system is also a transportation corridor for people moving through the city to take care of the necessary tasks of their daily lives. As such, it is woefully incomplete and will never achieve its potential until it is made so. We are all very sensitive to the costs of things in local government. Most of all, in no other area than in sustainable non-car transportation. So, as Poth noted in his talk with Advocate reporter Crystal Rhyno this week, knowing the numbers is vital to planning our spending for repairs, upgrades and expansion of our trails network. But I would caution planners that trails usage is not a popularity contest. The CPR Bridge is busy because it is useful. The trail to the McKenzie Recreation Area is less busy because it is less useful. McKenzie Trails is an end-of-the-road destination. Unless you are willing to climb almost straight up the river escarpment trail to reach Garden Heights, there is no place else to go. Bower Ponds is a nice destination, too, but from there you can easily reach Riverside Meadows, Oriole Park, Fairview, Heritage Ranch, West Park and downtown without having to reverse course. No knock against McKenzie Trails; the numbers there merely reflect usage of visitors for one purpose: to enjoy the park. A far larger number of people pass the electronic counters at Bower Ponds because they are going somewhere. The same applies to the Devonian Trails near Sunnybrook. I suggest that trail is a transportation link as much or more than anything else -- and the numbers reflect that. Here's a point I want to highlight from this study so far: in the absence of separated bike lanes to make non-car transportation pleasant and safe, our so-called recreational trails are carrying people who choose not to drive to every errand they conduct in their daily lives. Therefore, in order to be useful, the trails need to be linked and networked to the places where people want to go. In many places, they are not. Along the south bank of the river past the Riverlands construction project the trail is closed and will be for quite some time. There is a trail in the long-term plan for access from the new roundabout on 67th Street to the Riverbend Recreation Area, as well as all the new housing developments to the south and east. But it's not complete now, and therefore the existing trails cannot be fully used. Access from the city's north side across 67th Street to the whole of the rest of the city is extremely restricted and I see no priority solutions for that in the city's long-term plans. It's a barrier many would-be cyclists and pedestrians choose not to cross. All these things affect usage, which is not accounted for (yet) by the city's otherwise very good study. In 2013, filmmaker Andreas Mol Dalsgaard produced a watershed documentary titled The Human Scale. You can find it on Netflix and it's worth a watch. It's premise, proved by actual experience in several cities, is that planners hugely underestimate the benefits of trails and bike lanes -- when they are networked to places where people actually want to go in their daily lives. That, I think, is the biggest surprise w hen we continue our study that we have yet to discover. It should come to no surprise that Red Deer's park system is busy. Now the city has data to back up its claim. In July, the city installed six trail trackers to gauge the usage at some of the popular Waskasoo Park system entry points -- Bower Ponds, the CPR Bridge, Heritage Ranch, Mackenzie Trails and Three Mile Bend. The last time the city measured usage was in 2005 when it was preparing a trails master plan. Parks staff conducted surveys and manually counted people as they walked by for a couple hours over two days. Some interesting trends have already started to emerge with only three months of data. On average, between 180 and 600 people use the trails every day. "That definitely surprised us a little bit," said Trevor Poth, parks superintendent. "The stable amount of use is probably the most surprising use. We don't see an awful lot of peaks on the weekend or in the evenings. The parks are just busy all the time. It's a positive thing for us to see. We would have made the assumption before that the weekends are when we see the highest traffic in our parks. That's not actually the case. Of course it is based on weather, we are seeing it on Thursdays and Fridays." This new data will allow the department to plan for upgrades, basic maintenance and future planning. "During the challenging budget times, we will need to have some metrics to present to council," he said. "Parks data is always so tricky. How do you actually count the number of people out there without standing out there with a clipboard? This really helps us in a really efficient way to guage use of parks." The busiest site was the CPR Bridge. It saw 560 average daily users or (more than) 200,000 visits each year. Poth said people are typically using it to commute to and from work. There will likely be a capital request during this year's budget related to preserving the CPR bridge, said Poth. Three Mile Bend was the second most used site which was not surprising because it boasts an off-leash dog park followed by Bower Ponds, Heritage Ranch and Devonian Trails (near Sunnybrook). The lowest use was the Mackenzie Trails, a bit of a surprise, said Poth. "It is on the fringe of the city and 55th Street was closed for quite a bit of the summer," said Poth. "We are thinking it may have contributed a little bit." The counters will remain through the winter. The city will focus on monitoring the usage for a full year cycle. It will allow them to determine usage in areas like Heritage Ranch, a popular spot for cross country skiing. In the next few weeks, the city will purchase more counters to place on some hockey rinks to measure usage and patterns. Central Alberta shines as a trails destination where visitors enjoy more than 100 km of trails inside the City of Red Deer and many more trails in the urban and rural municipalities in the region. In a province that lags behind every other province and territory except Nova Scotia in building the Trans Canada Trail, Central Alberta shines as a destination for trail lovers. Central Alberta's rural and urban municipalities and local user groups have been working together through an organization called the Central Alberta Regional Trails Society (CARTS) to plan and build trails in Central Alberta. Red Deer County, Lacombe County and Ponoka County have each completed some sections of the Trans Canada Trail and continue to work to connect the Trans Canada Trail. Central Alberta's urban municipalities are also expanding their trail networks. Here are just a few things trail lovers enjoy in Central Alberta. Canada's First: The Blackfalds Abbey Centre has the honour of being the only place in Canada where the Trans Canada Trail travels indoors. The Tran Canada Trail goes right through the centre of the fieldhouse and walkers can head up to the second level to enjoy all the features of this unique section of the Trans Canada Trail. Great Rides: There are more than 110 km of trails inside the City of Red Deer and many visitors and locals alike enjoy riding along the Red Deer River and through beautiful Waskasoo Park and Heritage Ranch. Red Deer's trails are uncrowded and scenic. Besides this, visitors can cycle or walk between Red Deer and Lacombe along the Trans Canada Trail or enjoy other great trails in and around Central Alberta. Kerry Wood Nature Centre Naturalist Walks: The trails behind Kerry Wood Nature Centre lead through the Gaetz Lakes Sanctuary, Canada's oldest migratory bird sanctuary. Visitors can join a naturalist for a guided walk along the trails and slip behind a bird blind and get a closer look at the birds in the sanctuary. You'll Never Walk Alone: Central Alberta is home to a young and active population. There are two hiking clubs that meet regularly for group hikes in Central Alberta and beyond. If you don't like to hike alone, you can join the Red Deer Ramblers or the Central Alberta Mountain Club on a scheduled hike, presentation or training session. The Red Deer Birding Trail: Red Deer's Birding Trail includes the best trails for bird lovers to explore. Visitors can join the Red Deer River Naturalists on Sunday afternoons from September to May for their free weekly bird focus group walks. Wildflower lovers will enjoy the free flower focus group walks, which take place every third Wednesday from September to November and January to April. Pursuit Adventures: Red Deer's newest tour operator, Pursuit Adventures, can show visitors around the trails in Red Deer and delivers guided expeditions around Central Alberta and into Alberta's West Country. Bring This Story Alive: Come to Red Deer and ride our trails, go on a Sunday morning bird walk, and enjoy a tour with Pursuit Adventures. We'll set up an itinerary for qualified media. Lacombe County council has approved a plan to turn a generous land donation into a natural area laced with trails. Earlier this year, Frank and Rose Kuhnen donated 146 acres of land just north of Blackfalds near Lacombe Lake to the county. It came with the condition that the picturesque quarter section be kept as a natural area for the enjoyment of visitors. On Thursday, county council got a look at the plans to turn the heavily treed area with beautiful views of the lake into a green oasis for walkers. This year's schedule will see a gravel parking lot built on the southeast corner of the site near an existing campground and close to the TransCanada Trail. Signs will be placed to mark out the trails and some old fencing and a small pig barn will be removed and other general cleanup done. Next year, some of the animal trails that criss-cross the site will be cleared for human walkers and a small picnic area will be set up with tables and garbage cans in the southwest corner of the site. In 2017, a more elaborate day use area and a connecting trail is planned to the north. The existing Tipi Village Campground will continue to operate on 24 acres of land leased back for that purpose. Councillors were enthusiastic about the trail plan, which doesn't involve paving paths or creating more formal attractions, but aims to retain the natural character of the property. "I think it's great," said Coun. Ken Wigmore, he told staff. "I think your plan is good. Stay at it." In the future, the park will be seen as a "jewel" in the county, he predicted. Coun. Dana Kreil was also pleased to see the vision for the area. "I think it's fabulous," she said, adding she expects its proximity to the TransCanada Trail will make it a popular destination. Some concern was voiced by Coun. Brenda Knight, who questioned whether county staff would be stretched too thin trying to undertake all of the park work along with regular road and maintenance jobs. "I don't want to just keep adding projects and taking away from other things," she said. County operations manager Phil Lodermeier said the park work was designed to fit in with existing schedules and won't mean dropping other jobs. The park is just north of Blackfalds west of Hwy 2A. I read the news story about Red Deer becoming the only Canadian city to getting attention for being an international leader in promoting active living with a grain of salt rubbed into old wounds. That's because some of the scars are still fresh, two years after Red Deer received a national award for our pilot project on bike lanes. That whole experience (I became personally involved in assisting with the project) descended into the nastiest storm of negativity I can remember in our city. Still, this latest trip back into the spotlight reveals how little it often takes to make big differences in how people look at us, and how we look at ourselves. You want to know what ultimately got us that global attention? It was the fact that a good portion of our parks trail system is being kept clear of snow through the winter. That's the nub of it. Of course, the nub of it is surrounded by a lot more good fruit. Inefficient or not, our multi-use trails are an important part of Red Deer's transportation system. That's above being an important part of our city's recreation system -- and through that, an ever-growing part of our entire city's culture. We built it, kept it clear for use year-round and the people came. Here's a side not to illustrate how our trails have become such a valuable resource for both travel and for healthy living. It literally took years for the Central Alberta Regional Trails Society to get a paved trail built between Blackfalds and Lacombe. The barriers were tremendous -- not just the physical logistics, but because of the entire culture of this region. People want trails, just not near them -- even though trails immediately enhance property values and are proven to improve the life outcomes of people who live near the trails. With the upside so well-documented by now, landowners should be pounding on council doors for a trail extension to go near them. But our culture has been to say no to trails -- and especially to say no if tax money is to go into building them. 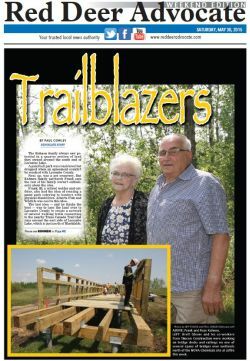 But the Blackfalds-Lacombe trail got built and in its first year, guess what the biggest complaint about the trail has been? It's that more money isn't being spent to keep the trail clear for use year-round. Now that we have it, Red Deer could not cease snow clearing on our city trails any more than the Trans Canada Trail network could pull out the Blackfalds-Lacombe portion of it. The benefits are just too real, too immediate, too culturally-altering, to turn back. Global sports equipment supplier Nike is the sponsor of the Designed to Move campaign, which seeks to inspire governments at all levels to pay attention to how their policies regarding design affect people's health, for better or for worse. The campaign hired a consultant, 8-80 Cities, to look around the world for places where governing bodies actually notice that their actions can either promote or impede the health of their citizens. The consultants discovered that Red Deer's trails are widely networked, integrated into our transportation plans -- and heavily used. Winter, we have found, need not be a barrier to moving ourselves outdoors for either work or play -- and that got the consultant's attention. I paid a visit to Nike's website (www.designedtomove.org) and found one of their primary goals is to interest children in growing to become active adults. They have a lot of science on their side. The site opens with the premise that today's kids may well be the first generation ever to have poorer expected life outcomes than their parents. That's because our car-centric, computer-centric, sedentary economy has produced a large population of overweight, unfit people. Their thesis is that if we design walking, biking, running, sports and general activity into our day-to-day lives, starting early, that the current unhealthy trend of rising obesity, diabetes, heart disease and even some cancers can be reversed. My thesis is that if we believe that exercise is good medicine, we will find ways to take it. When a significant portion of us realize that just walking or biking to work imparts a whole host of personal and societal benefits, we will demand that our municipal councils remove the barriers that keep us from just doing it. But the belief has to come first. Red Deer's status as an international leader in designing active living right from our front doors to our work-places and all places that we gather is only deserved if it stems from a belief that a healthy lifestyle matters -- for us and for all those who will live here after we've gone. Two years ago, we tore out the bike lanes just weeks after getting an award for them. That's OK, if we still believe it's important to remove the design barriers that exist now for people to live a healthy, active life. That may end up costing us a lot more money up front than simply clearing trails in winter. But hey, it's the gumption that wins the awards. Central Alberta Regional Trails Society is hoping both the County and City of Red Deer will partner with them to make a leg of the Trans Canada Trail System a reality between Red Deer and Springbrook. The Society has studied routes for the trail, with 4 options identified. 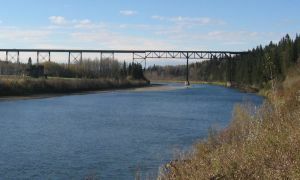 CARTS President Paul Pettypiece says they are attracted to the Mintlaw Bridge option, which brings with it great potential for tourism "the Mintlaw Bridge is a 21 hundred foot long steel trestle that crosses the Red Deer River just southwest of Red Deer. It's the longest abandoned railway bridge in western Canada; it would make a perfect trail; in fact it's probably the only real useful purpose for the structure, but it's the longest of the 4 options and therefore the costliest". Pettypiece says the bridge itself needs a fair amount of work to make it safe for pedestrian and cyclist use. He anticipates it would cost several million dollars to complete the Red Deer to Springbrook leg of the trail, with Trans Canada Trail and Alberta TrailNet prepared to fund 50% of the project. I read Paul Pettypiece's commentary in the June 23 Innisfail Province. I wanted to write a letter to support Forth Junction's efforts to preserve and give new life to the Mintlaw Bridge. I think restoring the Mintlaw trestle and converting it to a trail would be really worthwhile. The Mintlaw viaduct is a historical structure that has been abandoned for the last 32 years. It is a spectacular structure with an interesting story. Ever since I was two years old I've really liked trains and I think the Mintlaw trestle would be a valuable historical site for everyone to see. Actually, I know many people who really like trains and would be excited to cross the trestle when it's restored. Last summer my family and I went to Prince Edward Island where they have a historical trail along the Canadian National rail line, which was abandoned in 1989. It is called the Confederation trail system. This is PEI's contribution to the Trans Canada Trail. We spent seven days biking along and exploring the trail. I especially enjoyed the Elmira railway museum at the eastern point of the trail and the Montreal Locomotive Works engine number CN 1762 in Kensington. The trail had many signs to describe the historical features along the way. I think restoring the Mintlaw viaduct and adding it to Alberta's contribution to the Trans Canada Trail would be really cool for more than just rail fans. I think bicyclists, hikers and people interested in history would enjoy it too. Starting or ending a marathon over it would be pretty neat. There are times in our history when the stars line up to create an unusual opportunity to do something special that future generations will cherish. This is one of those times. A few years ago, Red Deer County was gifted for $1 the relatively unknown, historic 644-metre-long Alberta Central Railway steel trestle across the Red Deer River just a few kilometres southwest of Red Deer along with the right of way from Hwy 2A to Benalto. Since then, the County has thankfully invested several hundred thousand dollars to maintain its integrity as a significant historic resource. After all, it's the longest abandoned railway bridge of its type, not only in Central Alberta, but in Western Canada. Only two other bridges of its type are still actively used by the two major railways, both in Alberta. Furthermore, this bridge (built by a local railway company with dreams of interprovincial line through Red Deer) represents the opening up of the land west of the Red Deer River for settlement, development and reaching world markets. It symbolizes the entrepreneurship and work ethic of early settlers to the region. The dilemma is what practical use is there for this important historical structure that justifies the cost of maintaining it as a county-owned historic icon? There really is only one possible use -- as part of a regional or national trail network that exposes this important structure to the public and creates an active living resource that would attract people to this region. This is where the rare opportunity comes in. The Trans Canada Trail Foundation is looking to finalize its route in Central Alberta and is prepared to fund up to 50 per cent of the cost of renovating the structure for pedestrian and bicycle use. In addition, there is likely to be significant funding available for special projects to celebrate the 150th anniversary of the birth of Canada in 2017, although one significant funding opportunity has already been lost, the Canada 150 grant. Other significant funding is likely to be available from the province for active living, heritage, rural development and tourism projects. And let's not rule out significant corporate and individual funding for such a high-profile project. But the window of opportunity is brief. Trans Canada Trail Foundation funds, allocated in Alberta by Alberta TrailNet, will go to projects most likely to be completed, or at least started, by 2017. However, the decisions on those allocations are likely to be made by the end of this year, if not sooner. Let's not kid ourselves -- repurposing this bridge and the linear park approaches will be a multi-million dollar project and there are some challenges to overcome in order to proceed, including addressing the legitimate concerns of adjoining landowners. But it is unlikely that this amount of non-local funding will be available again in the foreseeable future, keeping in mind that Albertans have been among the largest contributors to the Trans Canada Trail. If Red Deer County and the City of Red Deer (who had both lobbied in the late 1990s to bring the TCT to Central Alberta) can work together to commit to this project (one of four possible routings between Red Deer and Springbrook), this landmark could become a major Canadian tourist attractor (adding further opportunities for both county and city residents). With the support of the Towns of Sylvan Lake, Penhold and Innisfail, this regional treasure and its linkages to those communities will be a lasting legacy to be enjoyed by generations to come. Let's not lose this opportunity. If you think this project is worthwhile, please let your municipal councillors know. (Red Deer Advocate Photo by Paul Pettypiece (upper) - The historic 644-metre-long Central Alberta Railway steel trestle across the Red Deer River could be the centrepiece of a new trail. Red Deer County council has received a plan regarding the possibility of developing a regional trail between Springbrook and Red Deer. Councillors accepted the plan for information during the regularly scheduled council meeting on June 2. The county earlier formed a working group to provide guidance to a consultant to develop the Springbrook to Red Deer Trails concept plan, which has now been completed. "The intent of this project is to educate partner municipalities on the realities associated with regional trail development so they can decide whether or not to move forward with other aspects of trail planning," county manager Curtis Herzberg said in a briefing note to council. The plan identifies a number of possible followup actions, including confirmation of principle support for the trail system from the county and the City of Red Deer, design and implementation of a stakeholder consultation process, further detailed analysis of potential operations of the trail, and solicitations of proposals from potential partners. "Although the final route for a regional trail has not yet been finalized, a number of route options have been presented and analyzed," he said. "The information that has been presented is sufficient for further stakeholder consultations and to identify order of magnitude costs associatied with trail development and operations. "The key next step is to design and implement a consultation process to gauge public and stakeholder interest in a regional trail linkage between Springbrook and Red Deer." County staff estimates the county's share of public consulations at about $10,000. County officials will be meeting with City of Red Deer officials this summer for further talks on the matter. I'm betting there will be quite a few surprised people in Red Deer when the results from this summer's trails use survey are made public. Considering how little hard information we have on trail usage, I'll admit that one of the surprised people might be me. Right up front: In addition to writing a blog and column in our daily newspaper, I'm also president of the Red Deer Association for Bicycle Commuting, and a recently-elected board member of the Central Alberta Regional Trails Society. So my bias should be obvious. I believe the future of city regional transportation includes a big increase in non-motorized travel. But how big a change would that be? Nobody knows, and nobody can ever measure it. Red Deer has no historical baseline for the number of Red Deerians who travel by bike. Therefore, nobody can give you a percentage increase in the numbers that would result from building more (or more useful) community trails, or from building dedicated cycle infrastructure. All we've got is a bunch of people who say they never see a cyclist, another bunch who say they ride almost every day and see plenty of other riders, and another group that says they want to ride more, but their particular commutes are too inefficient on the trails system and too unsafe on the streets. That's hardly a foundation on which to build a transportation plan. So better late than never, the city is measuring trails use. This summer, six small counters will be placed at various locations on the trails to count the people who go by. I'm told there is a way to interpret the numbers to determine how many of the "hits" on the counters are by walkers, joggers or cyclists. The city hasn't determined the locations as yet, but the counters are easily moved -- and better, they can be used for years to record changes and build a database. Hopefully, also to be used year-round. We already know the old train bridge over the river downtown carries the heaviest traffic on our trails system. The closer you get to that bridge, the more people you will see on the trails. Academically, it might be interesting to track where the flows of people go out from there. Nice to know, but as a planning tool it's less useful than knowing how many people in our residential neighbourhoods use the trails -- perhaps even to get down to the bridge as part of their trip. Myself, I am more interested in the numbers on four sections of our trails network that are designed for actual commuting as well as being regional connectors for recreational use. They are: the sidewalk/trail along 30th Avenue; the asphalt trail along 32nd Street; the trail along the west end of Taylor Drive that goes nowhere; and the trail north from the Dawe Centre all the way to Hwy 11A, which is the link to the TransCanada Trail to Blackfalds and Lacombe. There are other spots that need a monitor, but these, in my opinion, should be the top priorities. The multi-purpose routes along 30th Avenue, 32nd Street and Taylor Drive became the "least bad" solution to public opposition to separated bike lanes. They are designed to make lawbreakers of every cyclist who uses them and will likely eventually kill some of them. Think about the route that includes the sidewalk/trail on 30th Avenue, from the new residential areas along 67th Street, south to the high schools and the Collicutt Centre (a very flat and easy commute, if it could be made safe). Seriously, who would expect a cyclist to dismount and walk across every intersection along that route, as traffic laws require? I've heard it suggested that it's just as logical, on a safety basis, to require every driver to exit their vehicles and push them through the intersections. Injury collisions would drop to zero -- and we're all about safety, right? Yet cyclists, with every legal right to the road, must push their bikes through these intersections as if they were pedestrians. Folks, that just isn't going to happen. Not here, not along 32nd Street, nor any other of the "sidewalk" routes the city has built or planned. Through this design, cyclists must choose between an absurd legal requirement, or the risk of "right hook" and "left cross" collisions with vehicles. Which, by the way, are the top causes of injury and death to urban cyclists, along with dooring, where bike lanes run too close to parked cars. Cyclists are faster than pedestrians, and drivers who see no pedestrians often are not looking for cyclists when they turn right or left on a green light. That's when they sideline the cyclist suddenly crossing on the walk signal. Red Deer has been fortunate to have avoided a rash of these collisions, and I wonder if it's because cyclists simply do not like and therefore do not use these routes. If so, they are a waste of tax dollars on non-car infrastructure. Trevor Poth, Red Deer's parks superintendent, says trails use has grown more or less evenly with city growth. If he's right, I say that's a sign of failure. I have asserted for years that Red Deer's cycling community is growing, despite the shortcomings of our infrastructure. We know from the experience of nearly every city in the industrialized world that the proportion of commutes taken by bike is rising. If the numbers from this Red Deer study do not match that of the whole world, I will be surprised. If they do not show a growth significantly in excess of population growth, that will signal that as popular as they are, our trails are not a useful means for people to travel in the city -- and something else needs to be found. Who would be surprised in that case? A group championing a Red Deer-to-Springbrook trail left Red Deer County council without the strong show of support they wanted. "I was disappointed," said Central Alberta Trails Society president Paul Pettypiece on Tuesday after the council meeting. It was hoped that council would agree to help fund a consultation process to measure stakeholder and public interest in the link. That is the next stage as outlined in the Springbrook to Red Deer Trails Concept Plan. However, council didn't close the door on the trail initiative. "They didn't actually say no," said Pettypiece. "I think there's a few people on council that certainly see the value of trails." Who will use the trails and who should pay for them remains a sticking point with some councillors. Usership will be an important consideration, suggested Coun. Don Church. It remains questionable whether county residents not living near the proposed trail route would use it. Coun. Christine Moore said a key factor in making a decision will be what sort of support and partnerships are available. "The devil is in the details," she said. Four separate trail routes and cost estimates were provided to council. They include eight-km to 16-km trails depending on route, with price tags between $2.4 million and $8.3 million. Council voted to receive the staff report for information and to discuss the project with Red Deer city council at an already-planned council-to-council session late this month. Pettypiece said the group believes the city supports the trail concept and he would like to see the idea taken to the public for feedback and to gauge support. There is some urgency in getting the project rolling. As part of a nation-wide initiative to complete the Trans Canada Trail in time for the country's 150th birthday in 2017, funding is available covering up to half of the cost of trail construction. For the trail society, it is an opportunity not to be missed and likely a critical component of the project going ahead. The Kuhnen family always saw potential in a quarter section of land they owned around the south end of Lacombe Lake. A paintball park was considered but dropped when an agreement couldn't be reached with Lacombe County. Next up, was a pet cemetery. But Kuhnen family patriarch Frank says the rest of his family weren't enthusiastic about the idea. Frank, 83, a retired welder and outfitter, also had the idea of creating a game park catering to hunters with physical disabilities. Alberta Fish and Wildlife was cool to this idea. The last idea -- and he thinks the best -- was to turn the land over to Lacombe County to create a network of natural walking trails connecting to the nearby Trans Canada Trail that runs around the east side of Lacombe Lake, which is just north of Blackfalds. The Kuhnen family donated 140 acres to the county with the proviso that it be kept in its natural state for public use and not be sold. "It has to stay as it is," said Frank, who emigrated to Canada with a brother from Germany in 1952 as a 19-year-old. "That way it benefits everybody." After moving out West, he met and married Rose in 1952. They settled in Central Alberta in 1954. Frank was a young professional boxer when he was introduced to Lacombe by boxing promoter Jack Collett, who would much later donate 635 acres of his own land in the 1980s that became the J.J. Collett Natural Area just a few kilometres north. Kuhnen said the construction of a stretch of Trans Canada Trail around Lacombe Lake convinced him to donate the land. "We saw all the people use that trail. We decided we've got to do something." The Kuhnens, who have six children, 15 grandchildren, 16 great-grandchildren, and two great-great-grandchildren, also own about another 450 acres in the area, most of it farmland. They also operate the Tipi Village campground. Dale Freitag, Lacombe County planning services manager, said trails will be developed in the new park as an ongoing project over the next few years. They will be left as natural trails, not paved, and can be reached from the nearby Trans Canada Trail. Kuhnen Park was officially unveiled in a ceremony and community barbecue on Wednesday that drew about 100 people. This is shaping up to be a good year in Central for trail building. South of Red Deer, a long-sought trail link between Red Deer and Springbrook has taken a major stride forward. And Nova Chemicals is building trails on an unfarmed natural area just north of the plant complex. Central Alberta Regional Trails Society president Paul Pettypiece is understandably pleased to see so much progress on the trail blazing front. Anyone who has lobbied, organized and rallied for new trails has come to expect a few bumpy patches on the way. The Springbrook-to-Penhold route is a case in point. A 3.6-km trail was proposed and Red Deer County set aside nearly $760,000 in its budget only to run into a dead end in 2011. A disagreement between Penhold and the county on the most feasible route sidelined the project indefinitely at the time. The project was given a boost recently with the completion of a trail study that provides four potential routes. Pettypiece said county council got its first look at the results at a recent workshop and it is expected to come to a council meeting for a decision sometime next month. Getting the link moving forward would not only provide a much-wanted local link, it will provide a necessary component to extend the network farther to Penhold and, in time, beyond. "In order to get that south leg moving, you have to have the connection." The timing is right for more trail expansion. Trans Canada Trail is looking to complete as much of a nation-spanning route as possible by 2017, the 150th anniversary of Confederation. To speed things up, funding is available now that may not be there later. Optimism among trail builders has also been buoyed by Alberta Transportation's willingness to use its rights-of-way along highways as possible trail routes -- reversing long-held opposition. Pettypiece said trails offer relatively inexpensive -- when compared with recreational multiplexes -- healthy living options. "I think people want trails more and more. They see the health benefit of it." Out by Joffre, Nova Chemicals and its contractors have joined forces to create looped trails. On Wednesday, Nova and one of its contractors, Ledcor, held a tree-planting event at the site of what will be five km of looped trails on 220 acres of natural wetlands around Jones Creek, just north of the plant site. The Community Nature Trail is expected to be ready by the fall, as long as the weather co-operates, says Nova spokesperson Roxann Good. More than 9,000 trees will be planted along the trails, both to beautify the site and to follow through on a company commitment of "zero-net tree loss on our expansion projects." Nova announced the trail project at the same (time) as a $1-billion polyethylene expansion was unveiled in 2013. Stormwater work done as part of a nearby plant railyard expansion will tie into the wetlands area. The proposed ambitious Napoleon Lake Trail project, one that ultimately envisions a revamped system around the 2,000-metre circumference of the lake, has been unveiled to the public. Town officials and Barry Gonnelly, a landscape architect with L.A. West Landscape and Architecture and Design Administration, hosted an open house at the Innisfail Arena on March 12 and the public saw a design that proposes to be built in three phases and have a total cost of just over $92,000. The project, a joint effort by the town and the Rotary Club of Innisfail, is proposing to begin this July after officials review open house comments and feedback, and council decides this spring on whether to accept the concept plan and move ahead. Craig Teal, the town's director of planning and operational services, said even though there is a detailed design already on the table for what the town and the Innisfail Rotary Club of Innisfail want to do they are still open for suggestions. "From the comments we receive we may do some tweaking and changes, and that will be determined going through the Operational Services Committee and on to council to make a determination as the owner of the land in what they would like to see," said Teal. He said if council approves the plan next month the town will then have to hire a contractor to begin work. Rotary, which is providing part of the funding, is expected to begin construction in July of the first of two viewing platforms at the southwest corner of the lake, from its own pool of labour. The first phase of the project, which is budgeted for $17,100, aims to begin construction of the first viewing platform, a boardwalk and an interpretive sign. The second phase in 2016, which is also budgeted for $17,100, has a plan for the construction of a second viewing platform at the northwest corner of the lake, while the third and most expensive phase, budgeted at $57,800 for 2017, is looking at constructing a 128-metre asphalt trail to connect the existing ground/grass trail to the southwest viewing platform. The plan is to also create a gravel trail to the northwest platform from the roadway. The town and Rotary also want to add trash receptacles, benches and more interpretive signs along the trails, as well as creating additional trail linkages to Aspen Heights. When completed, the plan calls for the trail along the 2,000-metre circumference to be either gravel, asphalt, boardwalk, and with some sections still left with only natural mode grass. Coun. Doug Bos, who attended the open house, said the revitalized Napoleon Lake trail will be a "great addition" to the paths the town already has. "We are working with the Central Alberta trails system, from Ponoka to Red Deer, as well as the Trans Canada Trail so this will fill in some of the gaps when we get some of the other ones done between here and Penhold," said Bos. "It will be nice for everybody to use, not just folks from out of town but for people here too."